Love In The School Yard. There’s not many of us that can say that they’ve got married and have held their wedding reception in a headmaster’s garden at a real life school. But Alice and George did just that in July earlier this year. 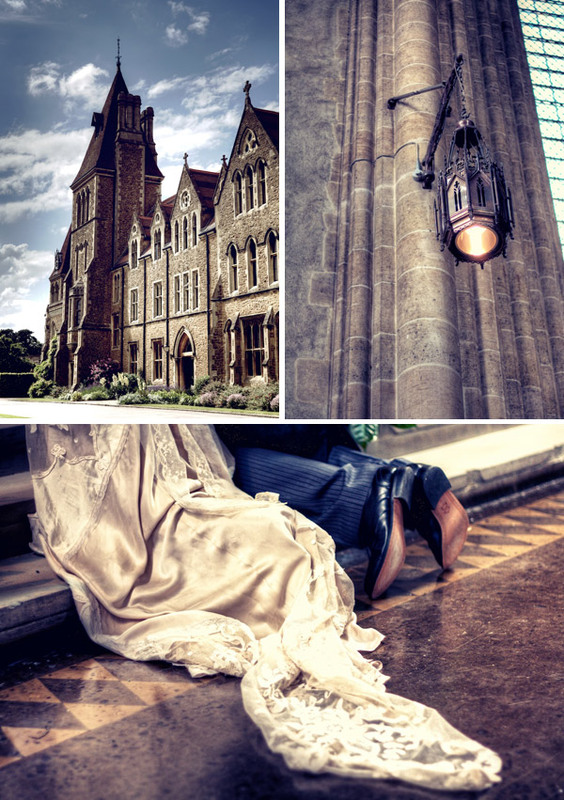 Their beautiful ceremony took place in the Charterhouse School’s chapel – an exquisite building that is most definitely a far cry from the scrappy hall that I used to have assembly in when I was a young lass. The newlyweds then headed over to the house of George’s father who happens to be the Headmaster of Charterhouse School to continue the celebrations. 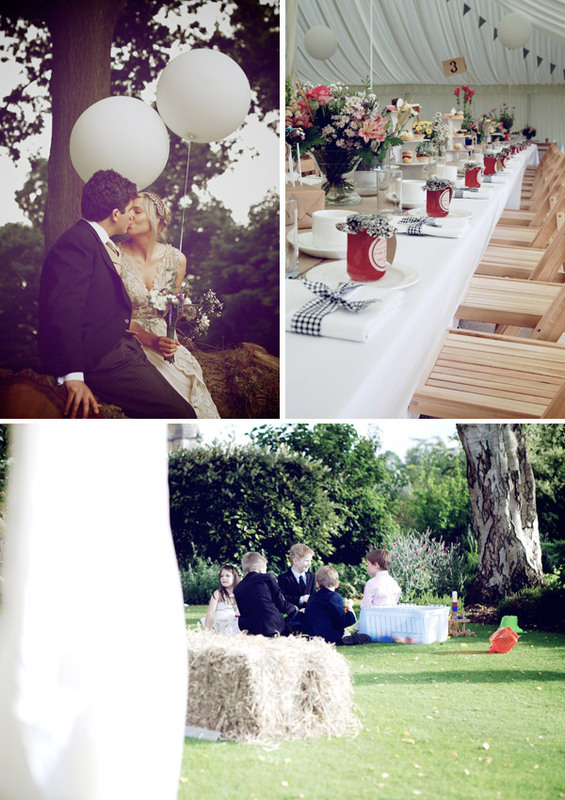 All the gorgeous images below come courtesy of our Love Lust List supplier Weddings Vintage. 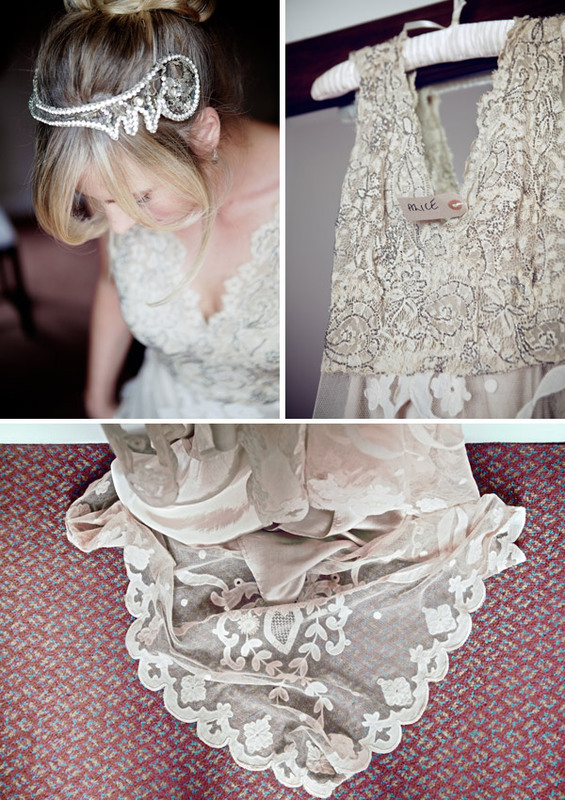 And just wait until you see Alice’s dress, folks…it is breathtakingly beautiful. My now father-in-law is the Headmaster of Charterhouse School, but also happens to be a vicar, so he married us in the chapel and acted as the toast master for the day. The wedding was on the first day of the Olympics, so the night before with my bridesmaids (and one usher) we watched the opening ceremony in the hotel bar as we ate some food. I work in Portobello where her shop is and I was passing one day and popped in not knowing it sold wedding dresses, and before George had even asked me!. When I was in there I saw this amazing dress and thought it I ever get married that would be my perfect dress. George proposed three weeks later the day after my 30th birthday, on the long walk to Windsor. One lunchtime I thought ‘Oh wow that dress!’, so I went back, tried it on, and that was the dress I purchased. It was half made and so Jane and I worked together to create my perfect dress. I have a degree in fashion design and so it was a brilliant collaboration of ideas, and lovely to be able to have some input. So many dresses are off the shelf, so it was extra special to see it evolve. The original piece of lace was over 125 years old and came from a French auction house, and was a stunning champagne colour. Jane did a fantastic job and I still pop in to see her and have a good chat. I was very lucky girl in that Jane Bourvis lent me this exquisite original 1920 head piece. I had been looking for one for ages and stumbled across hers deep in the piles of beautiful things in her store. It happened to be one of the few things that were not for sale so she kindly let me wear it; I will be forever grateful! I had my hair put up by Harrington’s in Guildford. I think I might be rather fussy about my hair as the trial was supposed to take half and hour and I was in there three.. oops, but they were very patient. For my shoes I used a company called Rainbow shoes, who dye to match. Trying to get six bridesmaids into the same pair of shoes is a logistical nightmare! We got there in the end with some Dune wedges with gold straps. I went with wedges as they are easy to walk on in the grass that had a more country feel. I realised I had lost a pair of the bridesmaids shoes the night before the wedding. Luckily, one of my bridesmaid’s boyfriends came to the rescue and tracked a pair down on the morning of the day and completed an hour round trip to go and get them. The missing pair haven’t shown up! 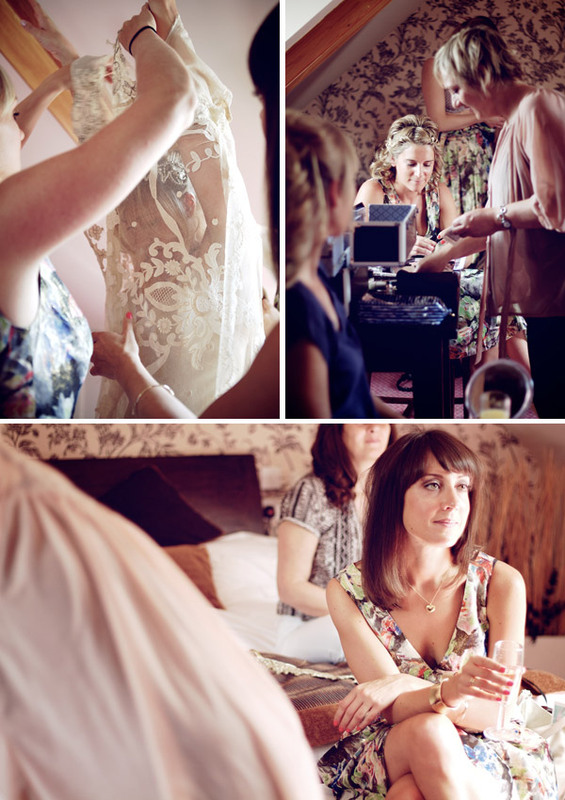 I had both my own and the bridesmaids’ hair done by the lovely Louise from Laura Mercier in Guildford. She did a fantastic job and didn’t even mind when she left the room for 5 mins and came back to find my naughty bridesmaids with their fingers in the make-up bag and in the eye shadows! I am very lucky that my now mother-in-law is a very talented florist so she helped me with everything. I wanted a very loose and country wild feel. We went to Longacres Nursery in Bagshot, which is amazing, huge and full of every flower imaginable whilst being very reasonably priced. We visited Longacres on the Wednesday and put the arrangements together on the Friday. I collected lots of jam jars and raided my grandpa’s shed for old oil cans which I put flowers in. 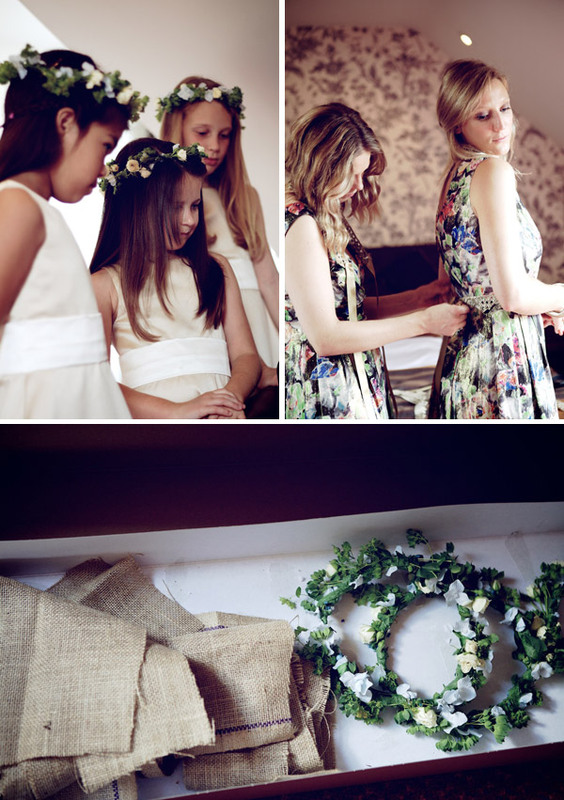 As my bridesmaids dresses were a multicoloured floral jacquard design I wanted to keep the flower girl dresses and George/groomsmen’s outfits as plain as possible. The dresses were from Jigsaw, I used to work there as the print designer, so it was a dress I had worked on which made it very special. I actually got the flower girl dresses made in China using this website. The website is amazing, and the service was so quick. It was a bit of a risk as I didn’t know what champagne colour would look like but as a complete fluke it was exactly the same colour as the slip of my dress! They were a bargain at £30. The flower girl shoes were little sparkly pumps from Monsoon. George went to Savile Row and the Hackett store to get his waistcoat and tie with his brother (best man) and Father. He got a gold foulard design tie and a plain sand coloured waistcoat. I was really struggling to find an affordable photographer who was very natural in their style. I wanted somebody who could take shots as natural as possible so they did not look too contrived. 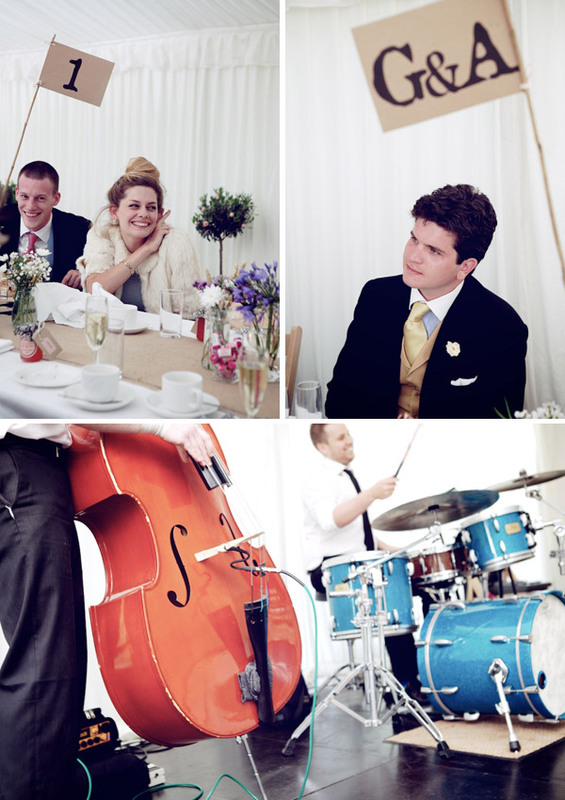 I was recommended Harriet Gill of Weddings Vintage by a friend; she was fantastic and exactly what I was looking for. She was brilliant on the day and was the perfect choice. She arrived the day before in the middle of my meltdown (every bride has one once!) and was just so lovely! I really do not think you need to spend too much money on the cake as you can buy brilliant plain ones and be creative. I bought 4 plain tiers from Marks and Spencer and some ribbons and my mother put it together the night before, and finished it of with some wild flowers. We hired a jazz band, the Blue Suede Shoes, from Function Central who played a great 2 hour set of funk and swing set to get everybody dancing! Afterwards a friend, who is a very talent DJ, played for us! As George’s father is a vicar our first dance was to ‘Son of a Preacher man’; the lyrics in it are very apt! George made Nigella Lawson’s chilli jam for all of our favours and I made the labels and stuck them on with string tied around a fabric top. We had an old school luggage tag that had everybody’s names on it as their place names on the table. The marquee was in my parent’s in-law’s garden which is an old Gertrud Jekyll design, it is already naturally very beautiful, and so I wanted to bring the outside in. We pulled all of the sides of the Marquee up so it was more like a giant gazebo. We bought some giant white balloons and some helium and put them on the tables and on the entrance to the tent. There is a separate summer house in the garden which we used as the children’s table for when the speeches were taking place, and put up some pink bunting for them. As my name is Alice, I wanted a slight theme to the day (Alice in Wonderland) and thought it would also compliment the walled garden. 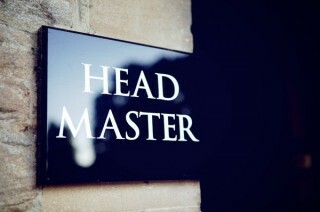 I had small touches around like little signs, saying; rabbit hole’ and this way to the party etc. We didn’t really have a strong colour theme as I think sometimes it can look a bit much with everything all in the same shade, we wanted something that felt a bit looser, which meant I could play with lots of different wild flowers in multicoloured shades. I made quite a lot of things for the wedding. I designed and made the invitations with George which was a real labour of love…not so much after 100! I couldn’t find any black and white checked bunting and so I decided to make it myself…150 metres later! I also realised on the day I only needed about 20, hahaha, so if anybody wants some bunting, get in touch! For the table plan we used an old amazing frame we found on the street and painted it white with a hessian background, then typed out the plan on brown paper. I bought some cardboard numbers and the pinned them on to the board. My best friend helped me create a mood board at the beginning which was a massive help as it meant I could visualise exactly what I wanted. I had had all these ideas flying around and millions of blog images and felt a bit overwhelmed with everything I could do. 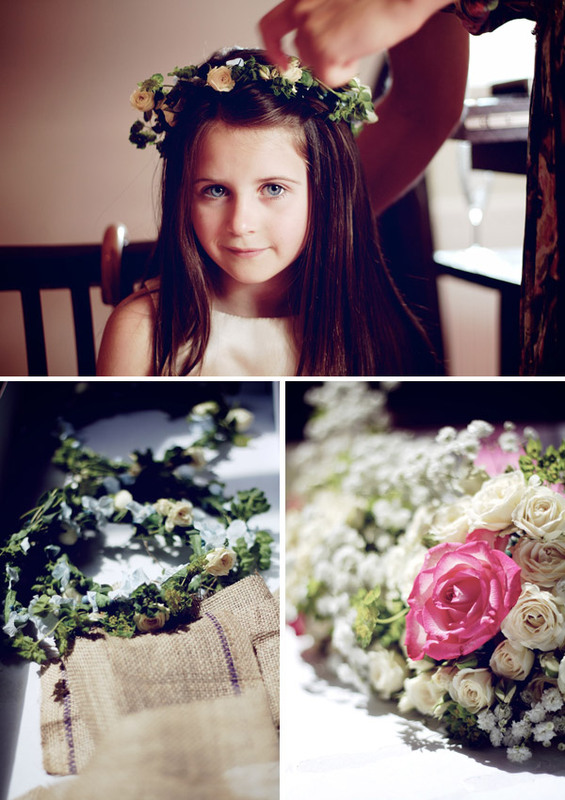 Creating it helped me focus on exactly what I wanted the day to look like, and what I needed to buy, where we could save money with things to make and how to show other people what I wanted, eg with the flowers etc. It also helped me show George, and he said yes and no to things he definitely didn’t want. My top tip is…give men specific tasks! I would get a bit stressed and say why aren’t you helping I have so much to do, and he would say well “how do I know what needs doing when it’s all in your head! I am not a mind reader”. They don’t really care about the visual things to much, just present them with a choice like “blue or green” and they can say yes or no, not “what colour do you think”? We started with lots of ideas and worked back to what was realistic. It’s impossible to do everything; you need to know when to stop, when to delegate and when to let go. Remember it’s really all about the love not about the napkin shades! Get the major things sorted first, your venue, dress, food, theme and cars; the rest will follow! When I was worrying about family politics and what people would think of various elements of the wedding, somebody said to me if anybody is there that is not wishing you all the best and wanting you to have the perfect day then that’s their problem not yours! Right about now I’ve developed a sudden urge to go out purchase some antique lace. Alice’s dress is simply dreamy. She also has some sound advice too. If any of you are experiencing anxieties about family politics or even worrying about people’s perception of the wedding, then you’re not alone. I certainly had my own fair share of drama. I absolutely 110% agree with Alice’s philosophy that it’s their problem not yours. If you’re able to, try to let it float over your head – it simply won’t matter on the day anyway because it’s about you two as a couple and the love you have for one another. She’s a wise girl is Alice. So come on folks, what do you think? Which part of George and Alice’s day do you love the most?